Carole Holding will be closing her Front Street store after 17 years due to the lack of cruise ships scheduled for Hamilton in 2013. Her products range from gourmet food to local arts & crafts, and can be purchased in-store, through her website and also via email at carole@caroleholding.bm. Soon Hamilton stores will all be closed..how sad is this. We were in a restaurant in the city at 7.30 the other night at there was only four people in there !!!! how do thet survive ? That is not a nice comment.If you dont have something good to say then say nothing.What you don’t like isn’t everyones opinion.Her pictures hand in hundreds of homes and offices here and abroad. Your restaurant should get better food. I was in one the other night and it was full. If you serve outdated crap, why should you stay open. Its 2012, not 1995! PLP only brings poverty. The country is broke. OBA have talked of natural attrition, not austerity. Stop spreading your PLP lies. We always received great products and good service from Carol!! Front Street will soon be known as Jinks Town as they take over. On the other hand, all of those people who look like me, who have been calling for opportunity, can now move in and run it with high wages and inexpensive goods. All the things they say on talk radio. I doubt it. Not one union will step up and invest. and not one talk show caller. I swear if you people vote the PLP in again, we are finished. This country is on its knees. Better get packing… PLP will win. Question is, what do you do next. The thing is, this isn’t a joke, and comments like ‘better get packing’ typify the blasé and arrogance of a party that solely gets elected on a black majority. As a parent of 3 young boys, I have a lot to consider – will more years of this Government really bring prosperity or are we headed down a path of higher crime, less jobs and greater social decay. In short, are we going to be a better or worse place to live. I actually am optimistic, we have options overseas, but my family have lived here a long while, and i don’t want that. The reason for my optimism, is because of your comment. That the PLP only think they can win, yet thousands of traditional PLP voters, sensible people who think enough is enough, who see the mess, who are angry with the unemployment and the corruption will do something about it. They may not vote OBA, but they won’t vote PLP either. Their protest will be to stay home. I don’t think anyone can say the OBA are a panacea for good change, but it has to be time to give someone else a chance. Blah Blah Blah fact is Bermuda is still a much richer and safer place to live than many other countries and almost all other islands so stop the whining and cut the BS and admit that you just want a white gov like 99% of the white voting population who only vote for the UBP(OBA), which is a recorded statistic you can look it up. We will be a richer place if people like you alway’s bring up colour…. Rob, cut the BS, if Bermuda is the worst place to live, why are you here? Maybe because in the big scheme of things Bermuda is a Great place to be. Well said FD….fortunately we can take solace in the fact that this type of mentality is slowly becoming the minority and not the norm….racism is not something we are born into…it has to be taught…the ONLY way to eradicate it is to STOP teaching it!!! The PLP did not become the government solely based on race…but it did have a major impact on the final outcome….have to admit that it was a brilliant tactical move to garner a win…but at what cost? Polarized a nation and set us back a hundred years!!! Mora and more now…the people are realizing that WE have the power to affect change in this country…the government is there to serve US…not the other way around…if WE are not happy then WE should make a change…and if they do not perform then WE should make another change…eventually they, the whole lot of them, will realize that they MUST perform or they will not govern. I have to wholeheartedly agree with what Mr. Jeffers said the other night on Let’s Talk…we need to be rid of party politics and vote solely on the ability of every individual to perform…we end up with the best people in the best position to do the best for us and our island!! As long as there are divisive “parties” involved there will always be ignorant voting along “party” lines…this most certainly does NOT guarantee us the best people for the job!! It is time for the people to take charge again…stop the bleeding before we are totally bled out…get over the us and them mentality and get on with healing OUR nation!! Black, white, purple, or orange; we need people in there who know how to turn things around!!!!!! Not that I agree with either one, but did not FD bring race up first? Don’t white’s vote UBP (OBA) 95%? When the UBP was in power were you using the same logic? Were you speaking about that then? Hey lets be clear here I DO NOT SUPPORT either party, but it really gets on my nerve when I see someone bring up that point about the PLP. Lets face it. If the UBP (OBA) were to put a frog in some place’s 20 years ago, whites would vote for that FROG. Because they would have never voted PLP. And you know why. Because of RACE. I really must have lived in a parallel universe Bermuda because when I was deciding on which party to vote for during the early days of the UBP it included many extremely smart, intelligent blacks, some of whom went on to be leaders of their party. We were told that blacks would never hold the economic purse strings in a UBP Government, even when the Premier was black – Sir E.T. Richards. I seem to recall that the UBP appointed Dr. Clarence James the Minister of Finance for many years (so much for that false theory from the then Opposition!). Cabinet Ministers included the likes of Stan Ratteray, Jim Woolridge (the best Tourism Minister we will EVER have), Lenny Swan, and later Sir John Swan and Pamela Gordon (daughter of one of the founding father’s of the PLP) – both of whom became Premier (the top job in any Government). But keep feeding young people with false propaganda about the UBP only being a white party. Who knows, they might continue to believe it! More evidence of an economic recovery during our Platinum Period. Run quick, while there is still time! Yes run for the airport and leave us behind… Please. Who needs your negative sentiment and the abandon ship mentality….??? Bye! come back when you get a taste of the real world! Yup, this all started under docB, and has been on a steep downhill slide since he first darkened our shores. Oh n don’t foget Zane DeSilva docB’s partner. Makes sens, need to get with the times. Her store could stay open if we get rid of a few islands……. The economy is turning a corner. Unfortunately it’s not in an upwards direction. So how many of the original 40 thieves are left. Loser weary brown making comments about front street changing, yes to shiat! And really, the forty theives. This economic turnaround with two shops opening in St Georges is killing us. Meanwhile the economic recession the PLP talks about continues in the US. Less than one hour ago I was in the Concord Mills Mall near Charlotte, NC. Bermudian NASCAR followers will be familiar with this one I am sure. The place is BOOMING. Carpark near full. Still want to believe the PLP? You voted for what you got. Had enough of it yet? Please drift away, or should I say stay in the USA. Romney needs you. A personal attack. Is that the best you can do? Typical PLP MO, when faced with unpleasant facts, attack the messanger. Pityfull. What facts did you present??? NOthing. Merely pointing out that Bermuda is done. Finished. And another PLP diehard comes out from under his rock to shout names & nothing else. You’re one of the reasons I can’t vote OBA, because people like you give it a bad name. Triangle Drifter or should I say OBA MP in a halloween custom playing tricks. Please do not equate Triangle Drifter with the OBA. He has already said he is not a resident, and he is a Romney supporter. He has given up on Bermuda, which is fine by me. He can stay there in NASCAR country. What did he say that was so offensive to you other than the truth??? Why make a personal attack? Well if the entire western world was booming id say you have a point but because your scope is so limited and your propaganda so weak I am only replying because its sunday and boring. You are right TD. The rest of the world is not, repeat not, in an economic recession. Take a look at Singapore….now Dubai is bouncing back strongly… and even Angola is booming. Actually, I was not refering to the rest of the world. I was refering to the US, in particular an area of the US that should be rich fishing grounds for Bermuda tourism, the East Coast or, a little further, anywhere that Bermuda is reachable from using one airline & no more than one connection stop. I’m actually surprised it he store stayed open this long!, the most I would get from there is a soda. The products were so outdated! Like stepping in a time warp from the 1980′s. Lesson learned ….. Either upgrade or close down! Thank you!… Well, they serve their market, retirement age cruise travellers. Well since there will be no cruisers next year (thanks Brother Furbert) this was inevitable. More people unemployed, as we continue towards 25% unemployment for Bermudians. That’s the legacy of the PLP. Permanent structural unemployment. That’s the legacy of capitalism as an economic system not the PLP, all capitalistic economy’s will have structural unemployment at one point. Who are you trying to fool with this Primary school propaganda? certainly not the educated and intelligent. No, the capitalist economy is the one that has been lending several hundreds of million dollars to the PLP government every year. The capitalist economy, having lent Bermuda $1.5bn, has subsidized Bermuda’s inept and amateurish government. But at some point Bermuda will have to pay back what it has borrowed, because nowhere in the Universe does anyone exist who thinks Bermuda deserves money for nothing. Do you “educated and intelligent” people actually have any idea how to run an economy, or do you just f… about all day complaining about capitalism? THe stores target market was not YOU…it was the tourist!!! If town was busy and it failed that would be one thing! But you are missing the point. The reason it is closing is that there are NO CRUISE SHIPS BOOKED for 2013 which means no access to her target market and 0 income. Exactly recessions are all about cutting the slack. Well since the plp isn’t cutting any “slack” I think I know what your use of the word means. I think you are in the wrong store. Carol Holding was always updated. You probably mean the store next door! Never been in the store in 17 years it was open, dam I didn’t even know what they sold. Oh well the rent in the City is crazy anyway. You have to pay between $5000 to $8000 a month for a spot like that. This is more than the loss of a single shop – it is the also the loss of yet another signature brand that helps to differentiate and create identity, huge currency when it comes to making Bermuda an interesting place for visitors, investors, etc. In its own small way, this loss is as significant as the loss of Trimminghams to make way for the Phil Butterfield/HSBC vanity project that contributes exactly zero to Bermuda. What we are left with is a prime street that could be anywhere thanks to what is either Governmental incompetence or worse a deliberate ethnic cleansing of a certain class of legitimate persons who have done nothing but faithfully contribute to this country’s prosperity over the decades – Thank you brothers Phil and Ewart either way . disconnected and extreme. How can you “ethnically cleanse” the Oligarchy (old guard) without violence they have all the money and connections lol. if you want to see ethnic cleansing look at USA backed and UK created Israel’s treatment of Palestinians. I think Zimbabwe is a better example than an oil driven war. You note that your family has options. To some degree, that is the problem. Most Bermuda residents do not have any option but to stay in Bermuda. These are the ones that are giving their all to make sure Bermuda does survive. The constant ‘harping’ about PLP voters voting based on the emotional aspects of being black is entirely misguided. Everyone who repeats the fallacy is ignoring the statistical reality that BLACK Bermudians are the swing voters. If they always voted the same way, PLP would not have won in 1998. I thnk the real challenge is for more white Bermudians to publicly join the PLP to have more direct input to policy formulation and to be a part of the change you wnat to see. We know how ostracised whites have been in the past just for the fact of joining the PLP. Accept the challenge and join the party. It is also a statiscal fact that Bermuda’s white population is decreasing and as time moves on there will be more and more blacks that form part of the electorate. This is even more reason why whites have to serioulsy reconsider their emotional allegiance to the UBP and now OBA. On a related note, all of the posters who attribute votes for PLP as racially based, you need to read your history books to better understand the social manipulation of the UBP to retain power and the effect it has had on Bermuda’s society. As an example, look at the historic race based immigration policies of the UBP and the intentional actions to change an historically black police force to a white police force. Reexamine the real reasons for why Sir. John was chosen to lead the UBP. If you are courageous, look at the underlying facts of why Craig Cannonier and Bob Richards were the only candidates for OBA Leader when Dunkley was and continues to be the preferred leader of the Party. My final comment for today is to realise why some of these shops have closed. It relates to an inability to change with the market place. If your business model is to cater only to visitors and the market has changed, you must adapt just as the government and International Business has to adapt. We can not continue to allow business failures to be blamed on government when it is not approporiate. In all honesty, one of the greatest business changes in response to changes in demand is Gibbons Company. It is one of the few that adopted its business model (along with AS Coopers to a lesser degree) and continues to thrive. Heads up – do not be surprised if one of the private schools close. All of them have expanded in recent years and now face declining enrollment. Can you blame this on government – no. Blame it on an inability to forecast future demand. We have to also accept that public education is better than is portrayed in the media… but that is another story. @Vote for me > Appreciate your informed response to much negativity. With that, Bermuda will do just fine and thrive again. BULLS EYE, this is why the Island is screwed up, and they just want to change a name and their whole flock of sheep follow. Black Bermudians are the swing voters. Before we get too carried away with that statement just remember that you’re in fact refering to only about 15% of registered black voters. Just because 85% (or thereabouts) of whites will never vote for the PLP don’t get off on this thing where people make it sound like blacks are the saviours at the polls when it come to casting their vote. At least 75% of blacks will never not vote PLP. And about 15% (or so) of whites ‘swing’ too. Whites are unfairly crucified as though they ALL vote the same when in fact they ALL don’t and the majority of blacks will only ever vote PLP. And seeing that registered black voters outnumber registered white voters by about 4 to one , who has the problem, in reality, if one is talking about race based voting ? ? Changing is coming…everyone is hurting…and the PEOPLE will work together to bring this island back. This is God’s plan…not anyone else’s. Guess you need to look at what % of Bermuda actually votes cause not all blacks & whites vote or are registered to vote. This is the whole in the just “Blacks are the swing voters” theory. It’s a crude use of the “Rule of Large Numbers”. An informed post for sure, but the reality of it will be missed in this never-ending ping – pong match. Declining tourism and shrinking IB can most definitely be attributed, at least in part, to government policies and actions. I am sorry to see Mrs. Tee’s shop is closing. 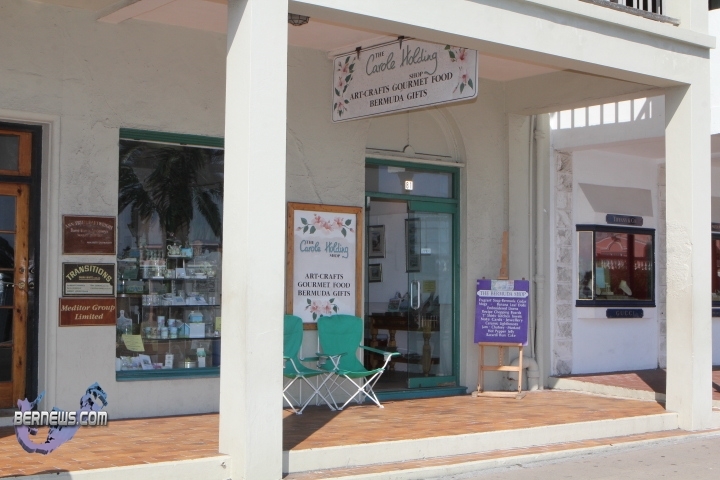 It was a great place to get Bermuda gifts for friends when I travelled overseas. I, and my non-Bermudian friends, especially liked the prints of her Bermuda paintings and the pink sand Christmas tree ornaments. Town is becoming a ghost place. Went to eat at Fresco’s last night and it was chained and double locked. Never heard that it was closing. I am betting there are a myriad other places like that – just quietly closing and locking their doors. Makes me so sad. I can’t see any of the private schools closing . Their numbers may go down as exempt companies leave but more and more Bermudians are sacrificing to put their children in the private schools as the public schools are so poor. If the PLP wants more white Bermudians to join, they are going to have to do a complete turn around in the way they view/ treat white Bermudians. The PLP is promoting themselves as the black party, always have, and since that is the case, you can hardly expect whites to vote for a party that they do not feel has its best interests at heart, and is repeatedly saying that they are opposed to the families that have historically controlled things (i.e. 40 Thieves). The PLP needs to show that they are working for ALL Bermudians, not just one part of the population. Actually, Bermuda’s police force has been historically white, not historically black; don’t know where you’re getting that statement from. The first officers of law enforcement were English constables brought to Bermuda from the U.K.
Clearly you did not read the statement from Carol Holdings. The statement said that the shops are closing because of the LACK OF CRUISE SHIP bookings for 2013. It has nothing to do with “changing for the marketplace” – because in this case, the marketplace has because virtually non-existent! You can update your store/ merchandise all you want – it’s not going to make a bit of difference if you don’t have the shoppers here. In this case, yes it IS appropriate to blame the government, because WHO is responsible for cruise bookings? Government and the Ministry of Tourism! Don’t even use Gibbons Co as an example, because they clearly cater to locals and not tourists – tourists are not coming here to buy clothes at Gibbons, they get that stuff for ten times cheaper at Walmart. “We have to also accept that public education is better than is portrayed in the media.” No, it isn’t. I don’t need the media to tell me that the education offered at a private school is far better than the education in public schools. I attended both public and private schools, and I experienced the difference in quality. I have nieces and nephews in public school now, and friends with their kids in private school, and I KNOW what goes on, and what they tell me. I don’t need to open the paper to know who is getting the better education. I agree with the comments made by Vote For Me. It is said that blacks will vote blindly for the PLP, but whites have even stronger blind ties to the OBA (UBP). Do white people even bother to find out what the PLP is about? No! A new party could be formed called Demons From Hell, but as long as white people see a few old familiar UBP faces they’re in! Blacks have historically reached out to whites, yet for reasons only known to them they keep their distance from us. You all can say what you want, I make no apologies for my loyalty to the PLP just like others make no apologies to whatever name the UBP decide to call themselves. Boy! VJ you are so out of touch, but then again we all know you are a horse with blinkers on. Bulls eye, and this will kill the OBA come election time. I read the Observer in Ja may ka nearly every day. The business folks there are having much problems . That in turn makes the distance from the have and have nots even wider. People are vastly under employed . Crime is some folks only understanding on how to make a living. This PLP government should outsource their talent . See how many takers that they get for the type of work and results they have to offer. Government ministers get nabbed for mis management of the lottery etc. another killed by paid assassin , ( who turns out to be a detective sergeant in the police force BTW). A bermuda man went missing last week down there , no news that he was found . Gangs everywhere…the reason is government policies that are not helping the people think clearly , businesses that close up never to be replaced again. Too much is too much so now there have been riots nearly every day the last couple weeks. Ignorance of consequences does not make the problems go away. Think straight , if so many business keep closing down with nothing to replace them, how long will you be able to survive in your area ? how safe will your lives be ? Folks you need to get a grip think straight. Every job that goes away is 5 other peoples lives that are then being diminished. The fact that some IB that may have an office in Bermuda has millions of Gold rand billions of Indian rupees or trillions of Gold pandas that does absolutely jack for Bermuda . I will straight up say that they would not hire the PLP government a job managing pay toilets. Here is the Universal Law of Change: Nothing changes unless something changes! If you feel you are better off now than you were in 1998… you must be a member of the PLP’s Friends & Family Plan. If you think our Country is in better financial shape now than it was in 1998… you must be a member of the PLP’s Friends & Family Plan. If you think Tourism has improved since 1998, that there may be some new hotels built here under the PLP… you must be a member of the PLP’s Friends & Family Plan. If you think that I.B. is impressed with the way our Government treats them… you must be a member of the PLP’s Friends & Family Plan. If you think that the PLP gives a care for the common working man, 3,000+ of whom are now unemployed.. you must be a member of the PLP’s Friends & Family Plan. By all means, if you are happy with the PERFORMANCE of the PLP to date, please be my guest and vote for them again. But mark my words, you will SUFFER!! What is really sad is that this article is about yet another Front Street store closing because of the lack of visitors in Hamilton, especially cruise ship passengers. Having been very closely involved with cruise ship operators I know as fact that both the cruise ship owners and captains begged to be allowed to continue to berth on Front Street because it was considered to be the ultimate destination when their passengers could literally walk across the street for sightseeing, shopping and entertainment. Make no mistake, larger ships (one at a time) could have continued to dock in Hamilton with some changes that would have cost far less than the docks at the West End. Moving cruise ships to Dockyard was a monumentally bad decision on many levels, and we are now paying the price. Surprise, the PLP screwing up a good thing. Say it isn’t so. But they had to come up with a good reason to build that dock! The party of bad ideas. So tired of dumb decision making at the cost to everyone’s future. you all are the master of your own destinies ….vote plp again and get prepared to eat your own feet to survive….the elitist globalists plan for thier world is in full swing while you all bicker about the oba /plp….so lost it isnt funny at all…you’ve been warned but you cant see it from inside this little box that you all refused to step out of….haiti is starting to look good now….i hope you like it coz thats where bda is heading at top speed. once you have jumped you cannot turn back….and we jumped in 1998.
thanks to all of you who said I MADE IT HAPPEN….where are these T-SHIRTS NOW…. Will there be a going out of business sale? This store is lovely but very expensive. I only buy a few things here and there because of the cost. Carole Holding’s store doesn’t only have products for tourists. She sells also rum cakes, jams, hand bags, jewelry.. you have to see the store because unfortunately her products can also be for locals. So Carole Holding is closing her prime location… a business that has been in operation for 17 years. This is something one must wonder, if a business on the main drag can’t survive who can? That’s right, not many! We have no one here. Let’s get together and fix this industry cause those currently in charge are only out for themselves.